We contributed to the major Social Justice exhibition at the Gallery of Modern Art in Glasgow throughout 2009. The exhibition was entitled sh[out] and included associated exhibitions of digital storytelling, cartoons, filmed storytelling performance and recorded oral history extracts. From 2 February - 18 March 2008 OurStory Scotland held an exhibition OurSpace at the Kelvingrove Art Gallery and Museum in Glasgow. The Kelvingrove has estimated that the exhibition was seen by more than 10,000 people. The exhibition was curated by Dianne Barry and opened by Hilary Third of the Scottish Government's Equality Unit. Following the official opening, visitors were invited to participate in further storytelling including video diaries. In addition there was a comic strip workshop on 16 February, where participants told their story in cartoon form. exhibition runs 28 March to 6 June 2015 at Old Gala House, Galashiels, with opportunities to see stories already collected and to tell your own story! Love Out of Bounds is an innovative project that crosses the boundaries between communities and brings us together to share stories of loves untold. From the beginning, OurStory Scotland has been concerned to have our stories told to a wider public and in visual as well as verbal form. 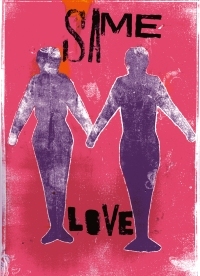 Our very first collective venture was our inaugural exhibition Becoming Visible which ran from November 2002 to January 2003 at the Glasgow LGBT Centre. The Nessie Girls exhibition in Inverness in June 2006 included caricatures by Aileen Graham and episodes by gay women and transgender women in the Highlands, providing a brilliant setting for a Speak Out storytelling performance. 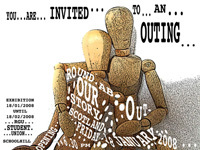 The OurStory Ceilidh in November 2006 included a wide range of exhibition materials from our storytelling throughout Scotland. Rainbow Stories in February/March 2007 was an exhibition at the Winter Gardens (People's Palace) in Glasgow. On display were visual and verbal stories collected during our intensive year of oral history and storytelling supported by the Scottish Arts Council Lottery Fund. At the opening of the exhibition, there was a special 'narrative exchange' session, in which the participants chose a story to read out from a wide selection of episodes written in or about Glasgow. Episodes were spontaneously selected across the boundaries that are often assumed to separate us. This was a great way of developing solidarity and demonstrating a genuine sense of community. Other exhibitions have included In/Out: Crossing Boundaries for the International Lesbian and Gay Association (ILGA) Europe conference in Glasgow, October 2003, and the Reach Out: Stop Discrimination exhibition in conjunction with Reach Out Highland for the European 'Stop Discrimination' Bus in Inverness in October 2004. We have also hosted talks by Dr Sharon Chalmers on her oral history and exhibition work with the LGBT community in Western Sydney, Australia. Exhibition held at St Mungo Museum, Glasgow, February 2012. 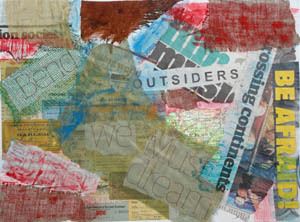 The exhibition features artwork, paintings, texts and collages from a year's workshops on Love Out of Bounds. From 18 January - 18 February 2008 OurStory Scotland held an exhibition entitled RoundABout at the RGU Union, Schoolhill, Aberdeen. The exhibition was opened by the Lord Provost of Aberdeen. 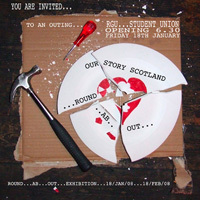 RoundABout was the culmination of our verbal and visual storytelling in Aberdeen from 2005 till 2008. 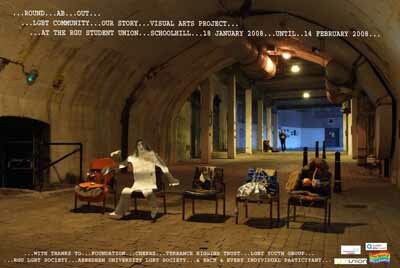 The exhibition was informed by stories told to OurStory Scotland, and incorporated a wonderful variety of visual forms. 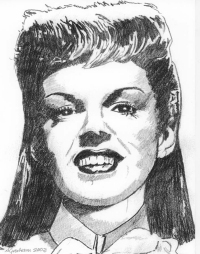 The exhibition was curated by Mark Duguid and Charlie Hackett, and they ensured that the creation of the artworks was inclusive and collaborative, involving venues that are not normally associated with art workshops, such as bars and clubs.